Hi, I am interested in your 1979 Pontiac Firebird (stock #4598-CHA) listed on Autotrader for $23,995. I'd like to get more information about this vehicle and confirm its availability. 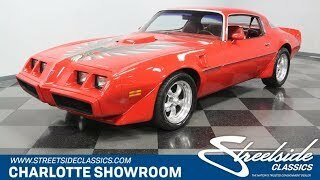 This is the car you always dreamed a 1979 Pontiac Firebird Trans Am could be. After all, it has a full bold red presentation inside and out, the right upgrades, and a freshly rebuilt 455 V8 under the hood done by a true performance master. The second-generation Trans Am was a seriously intimidating package. The wide ground effects in front of the wheel wells, integrated rear spoiler, and shaker hood all gives this a real presence on the streets. The updated front end for 79 was arguably the best. So when the dent-resistant Endura piece is as complete as this one, it gives the Firebird Trans Am an aggressive beak that perfectly complements the famous bird on the hood and B-pillars. It only gets better as this whole car looks like its breathing fire thanks to the blazing paintwork. Its the kind of bright red that helps grab attention away from the black Smokey and the Bandit replicas. In fact, this one reminds us a bit of another famous Burt Reynolds Pontiac. Remember the red Trans Am with chrome wheels from the movie Hooper? Yes, this one certainly looks the part from that speed demon stuntman flick. Just as that Pontiac was a famous for its surprise rocket power, this one also has hidden horsepower...but more on that in a minute. The fiery red attitude continues on the interior with the high-back bucket seats. Door panels, carpeting, and center console are all coordinating with this aggressive tone. But this is far from a sea of crimson. There are bright touches all around including the door handles, window cranks, and the three-spoke steering wheel. Of course, the most famous shining piece is the iconic machined aluminum inlay that covers the whole dash panel. There are modern components, too, including an AM/FM/CD stereo, provisions for R134a air conditioning, and all the gauges have been upgraded to Marshall units with a digital odometer. Underneath the hood is a seriously fresh presentation, and thats no accident. Youre looking at a V8 that is so new from its full rebuild that the new owner will be part of the break-in period. Because this is Charlotte, we can get our motors constructed by the same people who make the NASCAR race powerhouses. Not only is the new V8 solid, but its also larger than anything you could get in 79. This 455 cubic-inch motor with a four-barrel carburetor on top recalls the era of when Pontiac muscle cars had real muscle. Those long tube heads that feed the quad-tip dual exhaust really let the thunder roll. All this power is sent through a stout three-speed automatic transmission. The Trans Am was known to be one of the best handling American cars of its time, so that means power steering, sway bars front & rear, and front disc brakes. Plus, theres extra grip thanks to the modern Nitto NT555 performance tires riding on 17-inch American Racing alloy wheels. This is one fire-breathing T/A that finally has the performance to live up to its aggressive looks. Something this fresh and bold is not going to stay available for long. Call now!